These are crispy, not chewy. 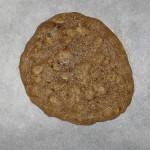 If you like a more chewy cookie, look under my Cookies & Bars category. 12 oz. semi-sweet chocolate chips – or any flavor. 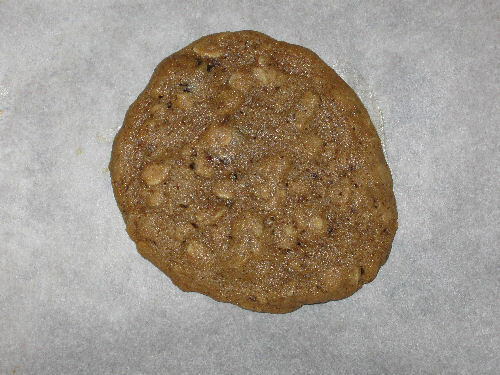 Preheat oven to 375 degrees and get out at least 2 cookies sheets – don’t grease them. Then set out the margarine and eggs for at least 20 minutes while your oven preheats. With a a mixer beat together the sugar, Crisco and margarine until fluffy. Add the egg and vanilla and beat well. In a separate bowl, whisk or sift the dry ingredients and add to the creamy mixture. Blend this well. With a wooden spoon, stir in the chips. With your hands (have the kids help) grab little walnut-sized globs of dough and make little balls. This dough’s going to spread alot, so place only about 6 at a time on each ungreased cookie sheet. Bake until light goldenish colored – about 15 minutes. Let sit on the pan for 1 minute then remove them to a cooling rack. Quite a name, quite a cookie. Named after my daughter’s favorite. You’ll need a food processor or blender for these. In the processor or blender, add the 1/2 cup raisins with the water and blend/blitz on high speed until really smooth. Scrape this out into a large bowl and add the Crisco, egg, sugar, and vanilla. Mix until smooth. In a separate bowl, with a wooden spoon, mix the flour, oats, baking soda, cinnamon & salt. Pour this into the wet stuff and mix well. Mix in raisins. Wet your hand and make dough balls (walnut size) and place on the ungreased or parchment lined cookie sheet. Gently press down to slightly flatten. Bake for about 22 minutes. Don’t overcook these. Remove from sheet and set on cooling racks. 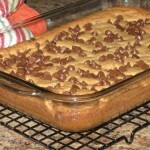 These were supposed to be butterscotch bars until halfway through making them I realized I had no butterscotch chips! Oh well, the chocolate chips worked great. 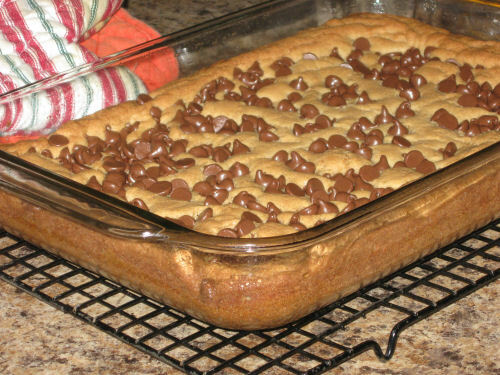 However, the next time making them I did use butterscotch chips and they were just as good! No mistakes here. Preheat your oven to 350 degrees, lightly grease a 9 x 13 pan and set aside. Cream the butter and sugar, add eggs and vanilla mixing well. In a separate bowl combine the flour, powder, soda and salt adding this to the creamed mixture stirring it well. Spread into the greased pan – you’ll need a spatuala – then sprinkle the chips on top. Bake for 30 minutes, till golden brown. Remove to wire rack, cool then cut & eat. 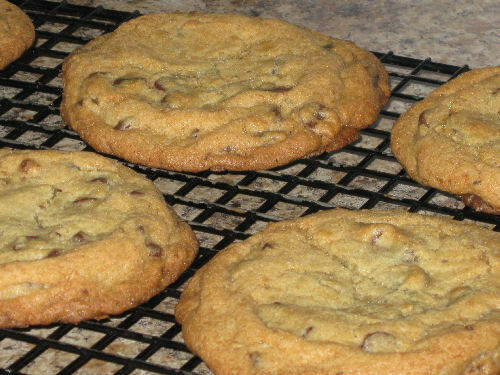 These are bakery-sized cookies so one batch doesn’t make a lot – you may wanna double it. Add a handful of your choice of chopped nuts or Heath bar bits, etc. with the chips if you wish. If stored tightly they’ll keep for about 2-3 days, but they won’t be around for that long. Preheat your oven to 375 and get out 1 or 2 cookie sheets. If you use 2, then you will have to rotate them half-way through the baking so they’ll thoroughly bake. In a small bowl, combine/whisk the flour, baking soda and salt. Beat the butter, Crisco, sugars and vanilla in large mixer bowl until creamy. Add eggs, one at a time, beating well after each. Gradually beat in flour mixture. Stir in chips. Using an ice cream scoop, scoop out the dough and plop down on the ungreased cookie sheet. Place only 6 per batch because they spread.